Dióscoro Teófilo Puebla Tolín, First landing of Columbus on the shores of the New World, at San Salvador, West Indies, 1862 (published 1892, Currier& Ives). (Dantadd via Wikipedia). In public domain. The title kind of says it all, no? On this Columbus Day, 2013, we should all acknowledge this as the beginning of the inadvertent (and frequently deliberate) genocide conducted against the indigenous groups that made up the Western Hemisphere as of October 12, 1492. 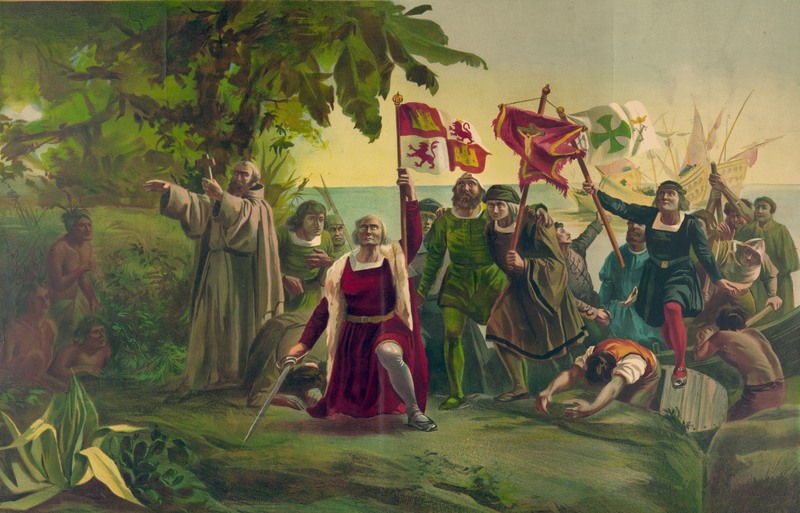 The day that Christopher Columbus “discovered” America — as if First Nation tribes or Native Americans or American Indians were looking to be discovered — was the first day of more than half a millennium’s worth of physical and psychological assault on the peoples of the Western Hemisphere. I talk about this in all of my courses — US History, World History (when I get to 1500 CE), and African American History. I describe how this notion of discovery was pretty much invented in the nineteenth century, to create a mythology about the greatness of God-fearing Europeans (and, in the US context, Americans) and their pre-ordained but altruistic triumph over the heathen Indians, those “noble savages.” I go over the fact that the Eurasian diseases that the Spaniards and other Europeans brought with them to the Western Hemisphere wiped out tens of millions of the indigenous between 1492 and 1700. Smallpox, measles, mumps, rubella, bubonic plague, chicken pox all helped reduce a population that experts have estimated to have been between 70 and 100 million at the time of first contact to between seven and 10 million by the end of the seventeenth century. Drawing in Book XII of Florentine Codex (compiled by Fray Bernardino de Sahagún, 1540–1585), showing Nahuas of Central Mexico suffering from smallpox, September 11, 2009. (Wikipedia). In public domain. The justification, of course, was and often remains that Europeans were civilized Catholic Christians, whereas these half-dressed natives were hedonistic polytheists. Even now, we often get caught up in the human sacrifice rituals of the Maya and Aztecs and somehow use that as justification for exploitation, slavery, and the inadvertent wiping out of whole cultures — worlds, if you will. It’s a justification that should make any believer in a higher power queasy, and any non-believer extremely angry. I’m disappointed. We still sugarcoat the real meaning of Columbus Day for people of all ages. I began to learn about all of this in fifth grade (thank you, Mrs. O’Daniel), in October ’79. But I didn’t come to know most of the full story until high school. Even then, no one — not Flanagan, Zini or Meltzer — mentioned disease, exploitation, slavery and warfare as the genocidal combination that essentially handed Western Europeans the Western Hemisphere. I guess they either didn’t know or thought that it would be too painful a lesson to teach fourteen-to-eighteen year-olds. As J. Robert Oppenheimer said in ’65, twenty years after the Manhattan Project’s success in creating the world’s first nuclear bomb, “Now I am become Death, the destroyer of worlds.” Well, one doesn’t have to have God-like powers or be a Hindu deity to create large-scale human suffering, as was the case with Columbus. All one really needs is the conviction necessary to treat other humans as if they are only meat with brains and eyes.